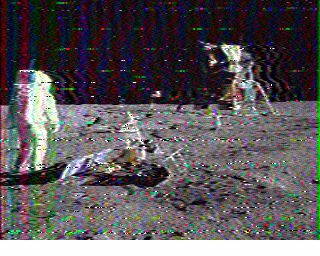 On July 20th 2009, AMSAT marked the 40th anniversary of the linar landing, by transmitting a looped audio and SSTV image. Here is the audio and SSTV image I recieved from AO51 satellite, 435.300MHz on 20th July 2009. 1729 GMT. SSTV Image received Robot 36 format. This is my homemade beam for receiving AO51. Wooden boom with bicycle spoke directors/reflector and a coathanger as a driven element! 4:1 coax balun. AO51 is a signal 7 on a good pass with the FT-817ND.